Statuesque Miniatures produces three sizes of accessories for converting your miniatures: Fine Scale, Pulp Scale and Heroic Scale. The Fine Scale Accessories feature the smallest heads of the three sizes and match those used on the Statuesque Miniatures Sci-fi ranges. The Fine Scale range includes the Resistance Fighter Accessories (SMA001-011) that are specifically designed for use with the Resistance Fighters range of figures. Products coded SMA101 onwards (more to come!) are designed for converting other ranges of figures. Check out the comparison pictures on my personal blog for examples of what I have done with this size of accessory. The Pulp Scale Accessories are the mid-size heads and match those used on the Statuesque Pulp ranges. These products are suitable for converting a wide variety of other manufacturers' figures. Again, check out the comparison photos for examples, featuring everything from female knights to evil cultists. 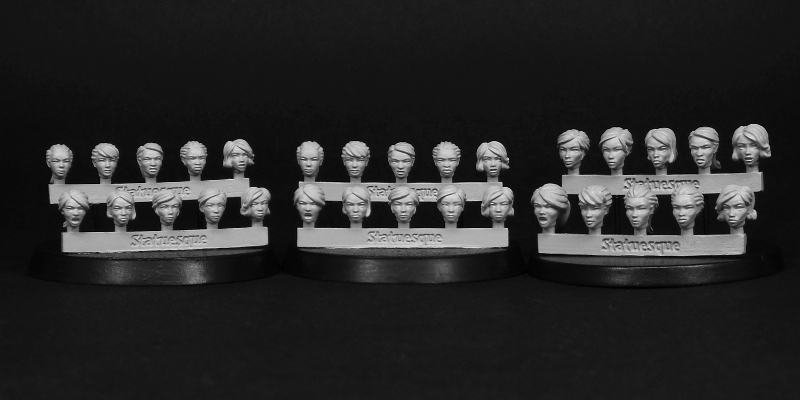 Please note that the current Pulp Scale weapon sprues are designed for male figures - big, punchy, pulp fists! The Heroic Scale Accessories are the largest of the head sizes, and are often used on popular sci-fi plastic kits of space knights and space soldiers. The Heroic Scale NARROW range is specifically designed for use with female heroic scale miniatures, or more slight heroic scale figures in general. I've put together some examples in the comparison photos, but you should also check out the Statuesque Miniatures Facebook Page to see what customers have posted of their own work.